On the Friday of our Digital Media Labs residency I decided to develop a simple prototype piece which could make use of some of the skills and new understanding which I had been able to develop. I wanted to try and make something which could involve an engaged audience in some of the more critical dialogues which have been taking place during the residency, relating to touch and participatory art practice. Ellie’s scratchcards offer a very clearly understood interaction – rubbing away the surface results in a potential reward. In her presentation Ellie pointed out that, once the cards are scratched the potential for that interaction is over but the images of the cards then become something else: evidence of scratching having taken place. Michael’s approach was to try and dampen the immediate consumer experience which the screens seem totally geared up to deliver: you press, you get. He placed different layers of the video timeline behind the surface, breaking up the expected narrative order. I decided to re-visit the image of a mousetrap which had featured in the video piece I had shown the previous day and thought about just how easy it would be to make a touchscreen mouse-trap. In a sense, the default for public realm touchscreen installations is that they operate on the principle of a trap – enticing a very narrow and choreographed form of participation through the use of some form of visual or other sensory “bait”. 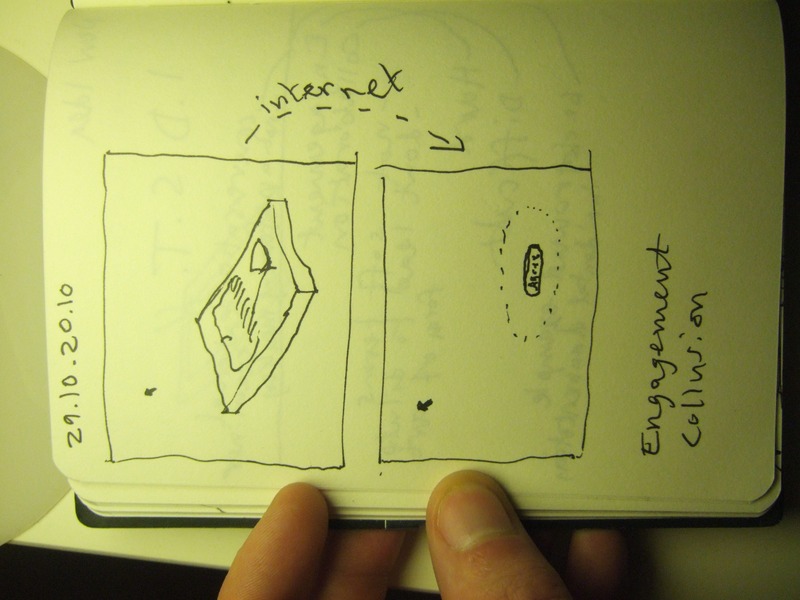 What might it mean to place an image of a mousetrap on the screen and to have NOTHING happen when the bait was touched? Rather than bringing into question the audience member’s expectation, I think that this strategy would only cause dissatisfaction and disappointment, since there is really only one rule of art involving technology: it must “work”! I was not alone on the residency in finding this “input:output” equation highly problematic in an art context and Ben’s presentation, (see A Winding Journey Through Technology) attempted to go off the well beaten track and flag up more interesting interactive transactions which were less clear-cut. Still wanting to play with the participants expectation I tried to think of ways in which an element of ‘menace’ could be returned to the mousetrap which had been so sanitised by its presentation onscreen. In the end I came up with an idea for taking the “touch” of the individual beyond the immediate flat screen, over the internet and seemingly out of their control. Although the piece was relatively simple to produce compared to some of the other works there were quite a few fiddly aspects in relaying information over the network (using the alternet library) and I simply would not have been able to complete the work (even to a prototype stage) within the time, were it not for Ben Dalton’s highly efficient coding and encouragement – thanks! 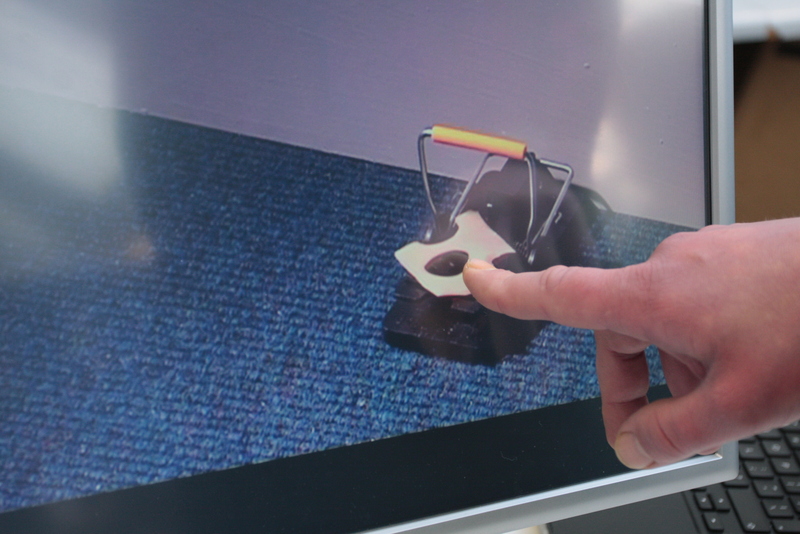 In the piece – “mousetrap” – the position of each individual touch of the touchscreen is recorded and sent across the network to another computer in a different part of the room. Each time an individual touches the touchscreen, unknown to them, a cursor on the second screen mimics their position. 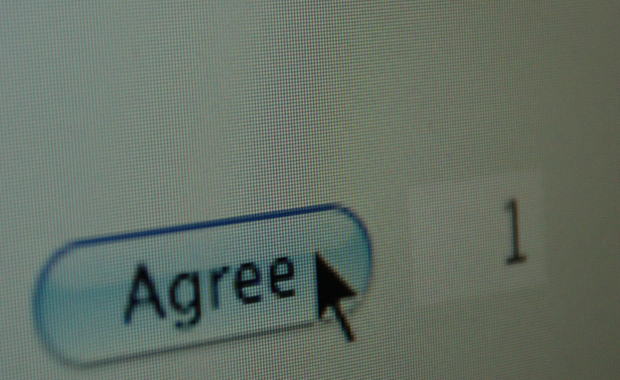 The second computer displays only a minimal webpage which contains an “agree” button and also a counter starting at zero. If someone does touch the cheese on the touchscreen trap then this clicks the “agree” button on the second computer and the counter goes up by one.